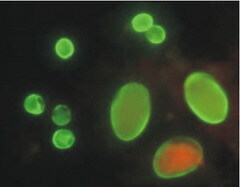 Many species of Cryptosporidium infect humans and a wide range of animals. The parasite is protected by an outer shell that allows it to survive outside the body for long periods of time and makes it very resistant to chlorine disinfection (EPA Advisory). While this parasite can be transmitted in several different ways, water is a common method and Cryptosporidium is one of the most frequent causes of waterborne disease (drinking water and recreational water) among humans in the United States. Giardiasis is an intestinal infection caused by the protozoan Giardia lamblia. Symptoms of infection are diarrhea, abdominal cramps, pale and greasy stools, fatigue, bloating, and weight loss. Diarrhea may last for days or weeks, or may come and go. Symptoms vary from person to person. Some people with giardiasis have no symptoms at all. Symptoms usually arise 5 to 25 days after swallowing the cyst. 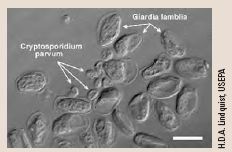 People and animals infected with giardiasis pass the parasite in their stool. People become infected either by direct hand-to-mouth transfer from the stool of an infected person or indirectly by swallowing water that has been contaminated with stool that contains Giardia (when swimming in ponds, drinking from streams, etc.). Our laboratory is completely equipped for environmental parasitology and possesses all the equipment necessary for performing EPA Method 1623.1 for analysis of Cryptosporidium and Giardia. BCS Laboratories conducts Cryptosporidium and Giardia analysis as per method EPA1623.1 to ensure compliance with local and federal safe water standards and Long Term Enhanced Surface Water Treatment Rule (LT2). Parasites have a low infectious dose and presence of low concentrations (1 parasite/10 liters) may be indicative of contamination. Thus, the method requiers sampling of 10 liters for source water and 100 liters for treated drinking water. Client may either submit bulk water sample or collected filter sample. Bulk water is submitted in 10 liter (2.5 gallon) or larger container. BCS supplies 10 liter sterile cubitainer bladder that is used for the sample collection upon request. Alternatelly, to conserve on shipping costs or for larger volume, water is passed through specially provided filter capsule (Envirochek HV) on site, the water volumne is recorded, and the the filter is shipped to the lab for analysis. BCS supplies (see below) the sampling kit with all necessary supplies needed to collect the sample from a water source.